Where do you want to put nuclear waste? The following article by Ben Heard and me was published on The Conversation today. This is a repost on BNC. Right now, radioactive material is stored at more than 100 locations in cities and suburbs across Australia. 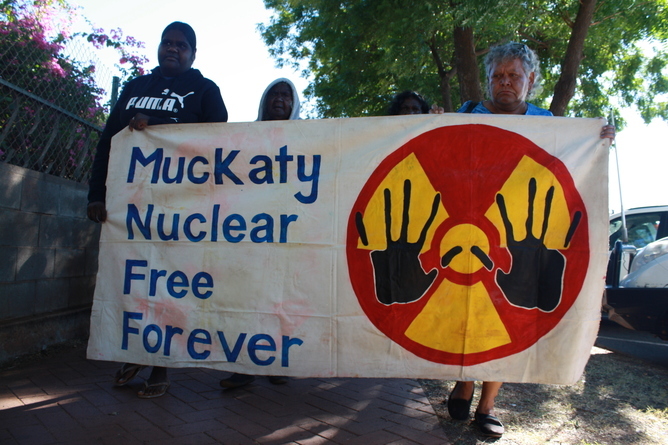 Yet after the withdrawal of a proposed remote site for a “nuclear waste dump” at Muckaty Station in the Northern Territory, we’re back to square one to find a longer-term nuclear waste site. Instead of trying to dump the dump on one remote community, we should be looking in our own backyards – including in the suburbs of our biggest cities – to solve Australia’s growing nuclear dilemma. 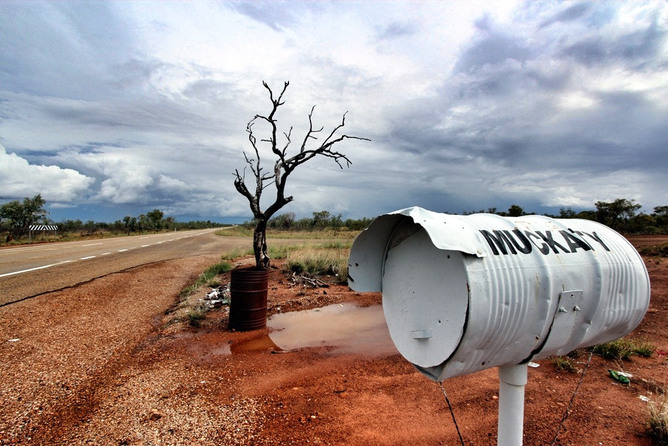 After years of debate, last week’s withdrawal of Muckaty Station as a possible nuclear waste site was the inevitable outcome of a flawed process. By failing to trust average Australians for so many years, successive federal governments have been unwittingly co-opted into the role of villains in an orchestrated campaign of radiological fearmongering. Radioactive waste is not automatically more hazardous than others waste. Indeed, it is demonstrably less hazardous than the organo-chlorine pesticides, poly-chlorinated biphenyls and heavy metal mixtures that also feature in Australia’s hazardous waste portfolio. Our radiological waste is produced for good reasons. The most radiologically hazardous waste is the result of producing life-saving diagnostic medicines (radio-phamaceuticals) that are essential in our health-care system. That’s why we need a centralised facility to house our waste in Australia. Fortunately, this material is relatively small in volume: about 4500 m3, or roughly the volume of a couple of Olympic swimming pools for the entire country. That waste is predominantly lightly contaminated soil, mostly relatively low in hazard, and well understood with mature techniques for treatment and storage. These are quantifiable facts and it’s an entirely manageable problem. But our point is this: if the authorities know, as we know, that this waste stream just isn’t that dangerous, why outback Muckaty or similarly remote sites in the past? How have we ended up with a process that includes only one site, with that site in the middle of nowhere? What message does that send to every Australian about this waste stream? “Wow. It must be really, really dangerous if we have to put it there”. And if that’s the message, what might any Australian with an interest in the land in and around Muckaty think about ending up with the facility in their backyard? The irony is that while the first statement is dead wrong, the second statement is quite reasonable. When dealing with any controversial issue – especially something as emotive as a nuclear waste “dump” – fairness eats facts for breakfast. Once a process is popularly perceived as “unfair” and the proponent perceived as untrustworthy, the facts about the hazard itself are irrelevant. So why have successive Australian governments from both major parties seemed hell-bent on starting a process from that impossible position? Most of our radioactive material can and should be transported and stored safely above ground in a suitably dedicated centralised storage facility for use on an intermediate basis (that is, for some decades). The identification of suitable sites for this storage facility ought to be principally a matter of infrastructure and zoning. Suitable sites for open discussion could and probably should be in the outer industrial areas of our capital cities. That’s right. Australian capital cities. That’s where it’s stored today, at more than 100 location in the major population centres, while it awaits long-term disposal. But this dispersed and disorganised arrangement is less than ideal; a centralised repository makes sense. Our cities are peppered with facilities managing all manner of wastes. They range from mundane but potentially hazardous municipal garbage, to the pretty unpleasant and decidedly toxic liquid wastes from commercial and industrial facilities, to the aforementioned intractable wastes for which there is no firm solution. We would never, as a society, consent to shipping this material from our cities to the outback. Even if we secretly wanted to, we know it would fail the fairness test. Proposing to treat one specific waste stream in this way only succeeds in tagging that waste stream as dangerous. That’s hardly helpful. If a suitable intermediate site is not available in a capital city then perhaps it could be found near a regional centre or a rural centre. Yes, the remote option is also available in Australia. But a process that begins and ends with a remote location is, by definition, a bad process. Bad, unhelpful and completely unnecessary. Countries that have had the good sense to deploy nuclear energy have a radiological waste stream that is larger and more hazardous than Australia’s. 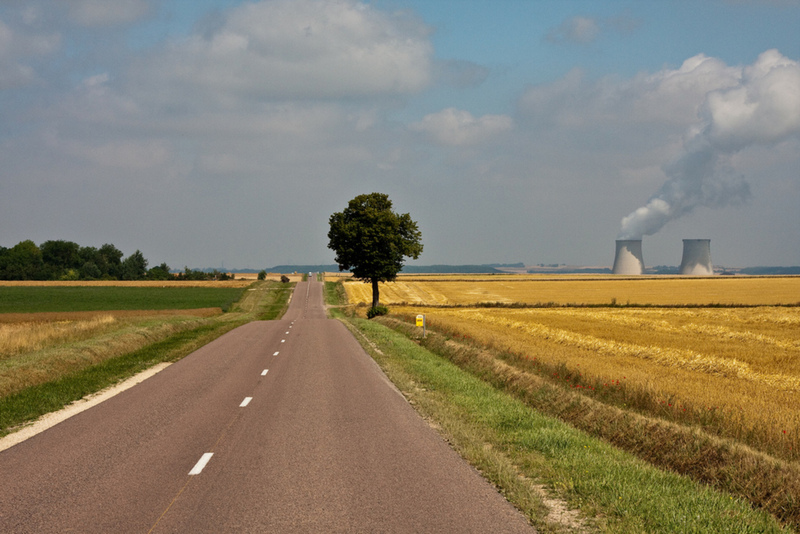 Yet reprocessed French nuclear fuel is stored in an above ground facility a mere 300 kilometres from Paris. We don’t see Australians cancelling their trips to France. Eventually, some of this waste material warrants more permanent disposal. At that stage, specific environmental characteristics become of paramount importance. 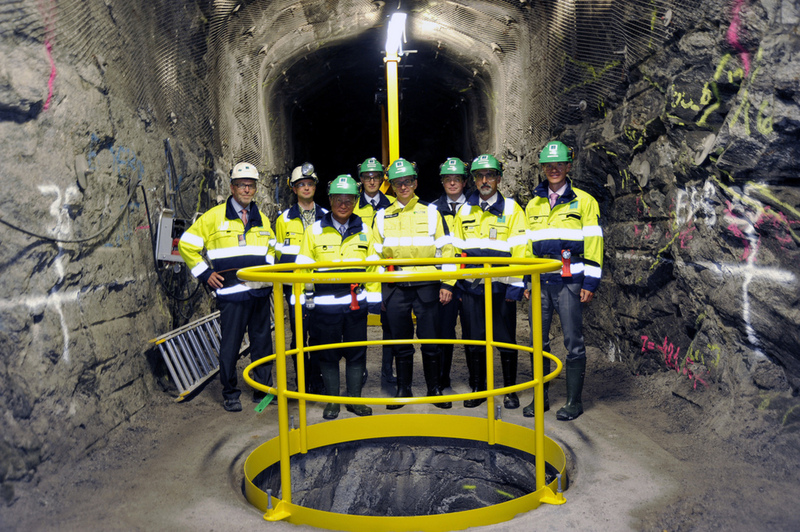 Over a period of decades, Finland treated their population to such transparency and respect that two communities, shortlisted from four sites, were actively competing for the right to host Finland’s underground spent fuel repository. The winning town’s council voted 20:7 in favour and celebrated the decision. Muckaty was reportedly being offered a A$12.2 million “compensation package” for hosting the facility. Like any contract of that value, we should be opening the process up to competition. Good, transparent process, focused on consultation, information sharing and education could identify dozens of locations around Australia that would look seriously at taking on a facility in return for a negotiated package of benefits to be shared across the community. In this case we are not likely to be looking at capital city locations. But it need not automatically be the most remote location possible. Australians are as capable of making rational decisions as any other nationality. But like everyone else our willingness to engage in a rational discussion is tied inextricably to perceptions of fairness, trust and transparency. The problem isn’t that the public doesn’t trust my clients. The problem is that my clients expect the public to trust them. They keep asking to be trusted, instead of working to be accountable so they don’t need to be trusted. And the problem is that my clients don’t trust the public. So, a message to our politicians and authorities from two people who understand and are not frightened of radiation: you can’t tell Australians something is not dangerous while trying to park it in the deep outback. Many people may be wrong about the radiological hazard it poses, but they are dead right about your behaviour. It’s inconsistent with perceptions of fairness, trust and transparency and they will hang you for it, ably assisted by those ideologically opposed to all things nuclear – even sensible solutions. The type of technical knowledge experts trade in is next to worthless when the true currency of trust is in short supply. Until Australia’s political leaders and relevant institutions are prepared to trust the bulk of Australians to engage with radiation issues as grown-ups, and until they are prepared to commit the time, resources and evidence-based practice to make this happen, they should prepare themselves to remain at the mercy of narrow and committed interests who will drive every bad process to its inevitable bad end. This is a good article, the public needs education from the fear and hysteria of nuclear waste, that with a little brainpower can be transformed into nuclear treasure. The wonders and potential of nuclear science and technologies, in Integral Fast Reactors or Fast Neutron Reactors, the Isotope Economy, the Hydrogen Economy, and the Fusion Economy has to be brought out into the open for public consumption. The world financial system is in disintegration; only by raising the population’s per capita energy flux density capacity can we begin to rebuild our physical economy, redeveloping the planet. The population has to understand the benefits of nuclear fueled energy facilities and economy platforms that will raise our standard of living. Australia has optimism. Thanks! It is a radioactive materials repository. We should meticulously avoid calling it a “Nuclear Waste Dump”, letting our antagonists win the argument before it has begun. The material is not particularly “nuclear”, although some of it is used nuclear fuel, which well-read people know is not strictly “waste”. We certainly don’t want that “dumped”, as there will come a time when its value is so great that it will be withdrawn from the repository for reprocessing. Most of the volume is material contaminated with radioactives of relatively short half life, above the legislated activity limits. Once it decays a certain amount, the volume (clothing, bandages etc) can be reduced for storage and the nonradioactive component disposed of. So let us respond to the sneering jibe, that it is more accurately a “Radioactive Materials Repository”. The Canadians have handled this well (as have Sweden and Finland, but not UK, USA, Australia). The Canadian NWMO site provides an example of how to do it. It provides transparency for all Canadians, achieves input from stakeholders, makes all the relevant information available for all stakeholders to access, and provides it in a way to support adversarial challenges, parliamentary inquiries, Royal Commissions, etc. As an example, you can drill right down to the actual test results for the permeability of the rock and the unusually high negative pore pressures in the target strata below the Bruce Nuclear Power Station, Ontario. [That’s an interesting story on its own, and I suspect we have similarly excellent strata in Australia too]. There is a great deal of useful information on the NWMO site, and a great example for Australia. It is for both the intermediate level and the and high level waste sites. It covers interim storage at the power station, long term storage and permanent disposal. The last three links in my previous comment were to an older NWMO web site. There is a new WNMO site for the DGR (Deep Geological Repository) investigations. This includes more recent work. See in particular these two reports as example of the depth the site goes to provide full access to the information. A pity this was only referenced to Australia. I was going to renew my plea to be given some of this nuclear waste, personally. I’ll take a 10 kW(th) Sr-90 source any time, so long as shielding and heat dissipation are done to my specs. Shouldn’t it be reprocessed? That way, the public can be informed that it is a “300 year repository” instead of a “forever dump” (and so we can finally get on with the development of IFR or LFTR as mass produced units). Right now we are talking about reprocessed waste. The HLW was sent to France and the actinides were removed. Australia gets the vitrified fission products back to manage as ILW. This is a concern around the world and each country struggles to determine the best way to handle this type of waste. I agree that certain elements can be reused for the greater good rather than letting it sit around for hundreds of years in a speculative state. Guy has suggested a very apt reference unit of naturally occurring radioactive material, Uluru in the Northern Territory (that’s in Oz). Uluru (aka Ayers Rock, 25.34° S, 131.03° E) is composed of an alluvial conglomerate rich in potassium feldspars. Its K gamma radiation indicates at least K ~ 2%. (Thorium radiation from its surface is high at ~25 ppm but may be biased by weathering residue.) It really is a separate large rock, with at least that much volume underground. Uluru’s mass and total potassium gamma radioactivity would follow from an estimate of its volume. Interesting comment. I’ll add a bit to it. Uluru (Ayer’s Rock) is mostly an arkose sandstone. Sandstones are most often comprised of quartz (sila) sand grains which are cemented by a variety of different cements. Arkose sandstone is different because it contains both quartz and feldspar. This is relevant for the design of a nuclear waste repository. Because, when the sediments are buried at depth, then strained (folded, sheared, etc. ), the feldspars makes the rock more ductile. So as it is being strained, the rockmass tends to be ductile and can ‘flow’ without fracturing. As you walk around or over Uluru, you’ll notice the rock is very unusual in that it contains very few fractures. You’ll also notice that the bedding planes (the sedimentary layers) are near vertical, That is the rock has been folded and where it outcrops at Uluru, the layers have been tilted from horizontal to near vertical. The fact it is effectively unfractured is significant for deep geological disposal because it means the hydraulic conductivity of the rockmass would be relatively low (if the rock substance itself has low permeability). Uluru is a highly visible, but minute sample of what lies below the surface over much of Australia. Almost certainly there are enormous areas of Australia that would have excellent geological, hydrogeological and geotechnical properties for permanent disposal of high level nuclear waste. Furthermore, Australia is the best continent in the world for permanent disposal of nuclear waste. It has vast areas of inland drainage, so even if there was leakage from the engineered barrier to the ground water, it can’t get out to sea. Secondly, Australia has low topographic relief. This means that ground water flow rates are slow. So, again, if waste did escape from the engineered barriers and get into the ground water, it would travel very slowly. Yes, the Mt Currie Conglomerate grades eastward into arkose sandstone at Uluru. Both date around 550-530 Ma, laid down during the energetic Petermann Orogeny. The much more extensive Heavitree Quartzite of 800-850 Ma covers much of inland Oz, laid down in a quiet inland sea. The interpretation as a fold was made during major studies of the area in the 1980’s by BMR. Since then, a higher resolution magnetic survey shows the conglomerate to be a thin skin sliding over and sinking into a salt layer, shaped by diapirs rather than folds. The coincident gamma radiometric survey shows rings of thorium as of an emerging diapir shedding its cover. Gravity measurements along selected traverses confirmed the diapiric structure. It follows that the Rock is a single object rolled over into the salt. Its K radioactivity is modest, but in radiometric images The Rock stands out against the barren quartz of the sand sea that has crept over the surrounding ground, an appropriate example of massive natural radioactivity. Thanks you fro that. You must be a geologist too. I was with BMR back in the 1960’s and 1970’s too. But I was in the Engineering Geology Section, so my involvement and interest was in dams, tunnels and large rock cuttings. The salt-bearing layer is also extensive across inland Australia. Thick salt beds are favoured as a repository, because water gets absorbed before it can get at the contents. It is also plastic, flowing with time to seamlessly close up the diggings. But I should defer to Peter’s expertise (above) on how to utterly seal a repository against all the scenarios of the fearful. 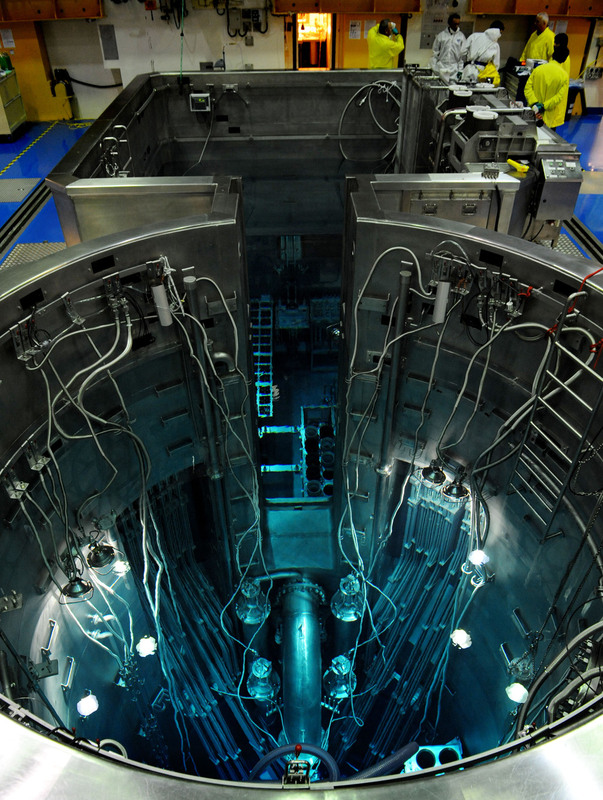 Best thing to do with used nuclear fuel is to recycle it till only fission products are left. They will require very little space after an increased use of uranium/thorium by two orders of magnitude. 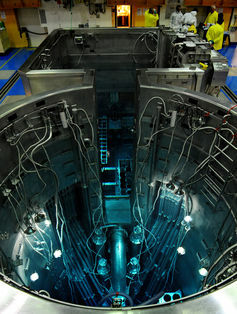 The most economic burner for used fuel might be an unmoderated MSR with water cooling involving a minimal moderation near the cooling tubes..
Less radioactive waste could be crunched to smallest practicable space and stored at convenient places available.